When our water filter broke, it seemed that the mountain had conspired against and defeated us before we’d even begun to climb. The summer of 2011 was one of the wettest, stormiest, and strangest seasons in memory. High snowpack combined with very late storms and cool spring temperatures kept the rivers running high and the mountains packed with snow far later into the season than an average year. Our several planned attempts at Capitol were repeatedly pushed back due to strong monsoon patterns that generated weather predictions like “70% severe thunderstorms” and “60% chance of rain and snow” for weeks on end in the high country. But now that September had arrived, we hoped that the monsoon pattern was behind us and we might have a chance at good weather for a summit attempt on what many call Colorado’s hardest 14er. Despite it being Labor Day weekend we set-out for Capitol’s trailhead hoping that our local position (1 hr drive from doorstep to trailhead) would give us a head start for the good campsites at Capitol Lake. The weather report was as good as we had seen it in weeks: Mostly Sunny, 20% chance afternoon showers. 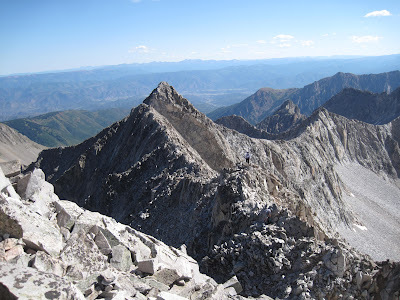 We decided to do Capitol at a leisurely 3-day pace, allowing one for the somewhat lengthy approach, one for the summit, and the last for the hike out. We arrived at the Capitol Creek trailhead and were greeted a cow and her two calves. 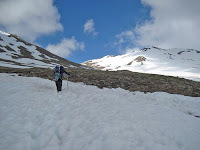 Though she refused to budge from her spot at the parking lot, she eyed us curiously and not without some suspicion as we yanked the final straps on our backpacks tight, cinched down our boots, and started down the trail. A large, slow-moving storm was rumbling to the north of us, but it seemed at worst that we’d catch the side of it and move on, the weather was supposed to be perfect, after all. 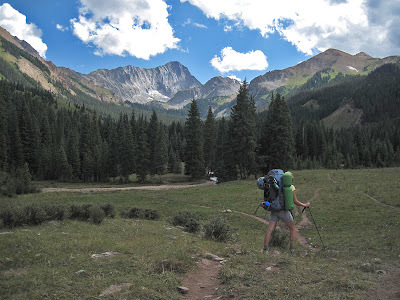 The Capitol “Ditch” alternative is a pleasant stroll that starts off mostly flat before climbing up into a beautiful meadow high above the creek. The north face of Capitol towered above most of our approach, capping off a green and lush valley with one of Colorado’s most impressive rock escarpments. It was about the time that we reached the junction with the main Capitol Creek trail that the rain began. It was a steady, soaking sort of rain, one that penetrates all but the most well sealed of shell layering. Bouts of hail came down in-between torrents of rain, and the skinny trees that populate the 10,000’ riparian zone didn’t provide much shelter. A few semi-close clashes of thunder brought back all sorts of backcountry memories: our Gore Range backpack trip where we had to wait out a vicious 3-hour storm the nearby town of Breckenridge called the worst in a hundred years, a multi-wave thunderstorm that ushered in the first night of an eight day stint in the Wind River Range, Wyoming, and the worst of all: a fifteen-hour onslaught that pinned us down for a sleepless night and then some at Geneva Lake last summer. We couldn’t believe that the good weather we’d waited impatiently for all summer had been replaced instead by more of the same. It hailed hard on us as we crested the last hill to Capitol Lake and selected a campsite. You could feel the ice pelting off your head like so many stones. Pitching a tent in a storm is a messy and sloppy process, and I could sense the mounting frustration in both of us as we tried to erect our flimsy shelter. Of course by the time the time was up and our gear inside the storm had stopped, so we decided to take the window of good weather to eat our dinner and pump water for the climb the following day. It was hard not to stare up at Capitol’s rugged battlements in both wonderment and some terror. K2, a major false-summit and obstacle on the class 4 standard route which we were planning to attempt, was clearly visible, and it wasn’t hard to ascertain the approximate location of the Knife Edge from there. We sat silent in the shadow of the great mountain as we ate our dinner, reflecting on the wilderness and mountains and mountaineers. Once dinner was through, disaster struck. It started when I kicked the stove into the lake, which luckily floated as the propane canister had just enough to get us through the three days. Only minutes after the soggy retrieval, a gust of wind up-ended what remained of our macaroni and cheese onto the rocks at the lakeshore. We laughed off these two errors a small, albeit annoying, inconveniences and prepared to refill our water bottles for the following morning. Already, the alarm on my phone had been set for 5:00 am. That was when the water pump broke. Something, it seemed, was conspiring to keep us off the mountain. But thanks to the goodwill of some fellow campers, allowing us to borrow their pump on the contingent that we’d fill their bottles while we were at it (we offered, they didn’t insist) we were able to top off our water bottles and camelbacks and carry on with our bid for the summit. Almost predictably, however, the rain started once again as we pumped, and the bright stroke of a thunderbolt reminded us that many things can end any mountain attempt and any illusion you might have of control is just that, illusion. It was the mountain that was in charge, and we weren’t here to “conquer” it. The next morning we awoke from a fitful slumber to clear skies. We made oatmeal trying not to think of the line from the John Prine song “Illegal Smile” “…a boat of oatmeal tried to stare me down, and won….”. 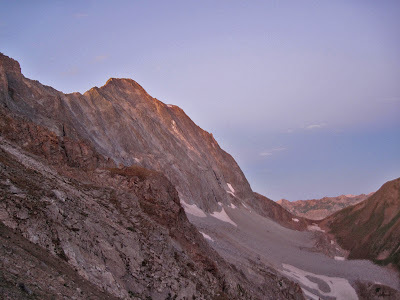 Already we could see a number of headlamps weaving up the steep, grassy slope to the saddle between Capitol Peak and its neighbor Mt. Daly (13,300’). Once breakfast was down, the gear, water and food for the day sorted, and the boots cinched tight, we began our way up the long slope for ourselves. Ahead we could see six headlamps. The three we’d seen first thing in the morning were near the top of the slope and the other group was about midway when we hit the bottom. That was about when we saw the fox for the first time. It was still dark; the pale glow of starlight dimly illuminated the jagged corners of Capitol’s north face. Suddenly, not forty feet away, two green eyes caught my headlamp’s dim glow. The animal was still but didn’t look afraid. I could tell right away by the tail what it was. The fox was on the slope above us, and as we crew nearer he trotted ahead, following the trail as it switchbacked through the grass. Several times the fox would stop and turn to watch us only to continue along the trail ahead. At one point it let me come within fifteen or twenty feet before leaping on ahead just like a nimble-footed dog. This went on for a strangely long time. But suddenly the fox darted off the trail south towards Mt. Daly. We lost it in the darkness. Still, for an such an otherwise elusive creature it was a strangely long encounter. Ella caught up and we continued up laughing, already our prospects seemed brighter and not even a hint of a cloud graced the sky. The sun was about to come up and the mountains around us were coming alive with color. A dim red glow was cast over Capitol’s imposing face. Strangely, despite Capitol’s jagged aspect and intimidating stature, I didn’t feel the anxiety that I had always expected I would on Capitol Day. 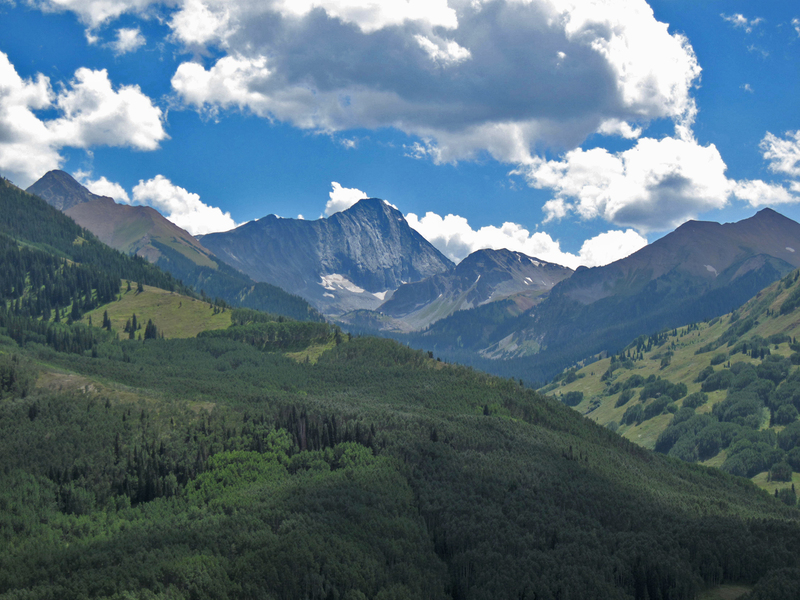 You can say what you want about whether Capitol is Colorado’s hardest 14er, but it is hard to deny that Capitol has a certain reputation. 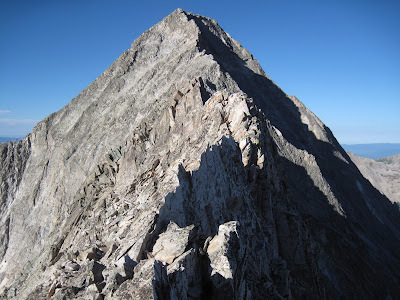 And I wouldn’t doubt that if you polled the mountaineering community to name the hardest 14er in Colorado, no mountain would get more votes than Capitol. A few switchbacks later, I stopped to rest and let Ella catch up when I saw behind her, trotting casually up the trail, the fox had returned. I called out to Ella and she turned just in time to see it veer off the trail not fifteen feet from here and disappear once and for all into the bush. We couldn’t help but laugh in amazement. 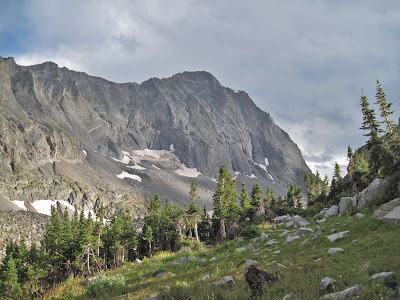 When we reached the 12,500’ saddle, we had already climbed over a thousand feet, and a cold breeze was sweeping forcefully in from the west. We stopped to throw down a quick snack and adjust our layers to the changing temperatures. From here the route drops behind the northeast ridge proper into Moon Lake Basin. It was here that the class 1 trail hiking came to an end. 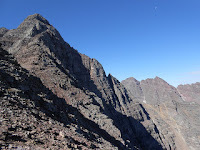 Contoured south and then southwest up the basin below some jagged cliffs, turning at last toward a distant point that materializes into the infamous sub-peak “K2”. K2 has only 84 feet of topographical prominence and therefore is not considered a true peak, but it has stature nonetheless. After much class 2+ and even some class 3 (possibly avoidable) scrambling up the boulderfield, K2 was the first real obstacle on our route to Capitol. There are several options for dealing with K2. Some choose to climb to its summit, a nifty throne whose view of Capitol is famous, then traverse west and downclimb some class 3-4 rock onto the ridge. We chose to forgo the energy expense and instead traversed west into a steep gully on the north face. A group of three post-college age boys had been leap frogging with us for so long to this point that our groups had merged. As we descended down the steep 2+ gully one at a time, it was already becoming apparent which of the five of us was going to struggle with Capitol’s unique difficulties. At the bottom of the gully there was an intimidating class 3+ pitch up some very loose rock to escape off the north face back onto the relative safety of the ridge. We did this pitch one a time to minimize rockfall. 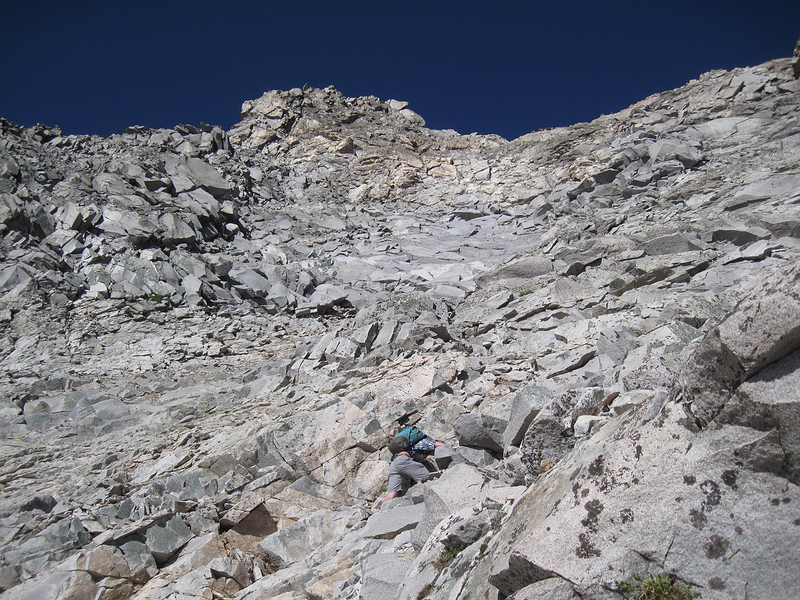 At one point near the top I was drawn into a variation that ended in a choss pile where it seemed every rock was loose and ready to tumble down 1,800 feet down the north face to Capitol Lake. I hesitated for a minute at the crux move, feeling particularly uneasy about the stability of the rocks above me. “I don’t know what I can trust,” I said to our new friend Rob above me, as I gingerly tested the most promising candidates for my next hold. I could tell he was right. Trying to move like a feather, I climbed up the final eight feet to the ridge next to him and waited for everyone else to follow. It was at this gnarly pitch that we lost the first of our companions. Unnerved by the loose rock and exposure down the north face, one of our new friends called out that he was going to be spending the rest of the day at K2, tracking our progress and patiently awaiting our return. 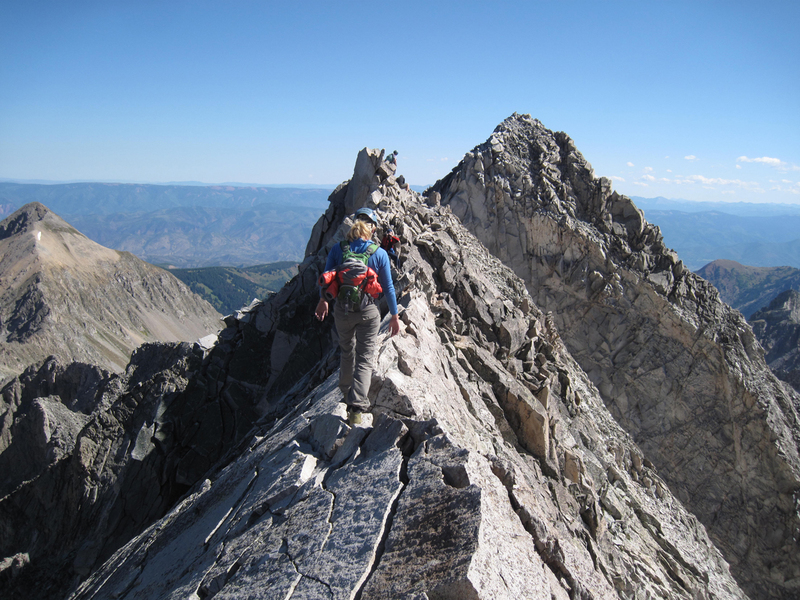 I understood; it was a maxim I’d learn to live by in mountaineering: prudence over pride. But for me, after years of high ridges and my latest addiction traditional rock climbing, had brought me a confidence that kept the nagging threat of exposure at bay. After the loose pitch, we rounded an easy class 2 corner and next to a notch between K2 and the northeast ridge. Here a dramatic cliff to our left got whatever was left of my attention to get. Thousands of feet of air was all around. I surveyed the ridge ahead and the breathtaking view of Capitol and tried not to imagine the entirety of the task before us. Though the summit was closer than ever, it still seemed a very long ways away. And it was obvious from our new perspective that a great number of difficulties were in our near future. This was clearly no place for the “gaper” or “neophyte” crowd you might find on the summit of Mt. Elbert. We waited a few minutes for our two remaining companions to catch up in quiet contemplation, neither of us speaking of what stood before us. It was of course, what we had expected from Capitol: a skinny and jagged ridge with 70 degree drop-offs on each side, sharpening, at times, to a fin small enough to fit our hand over that led to a steep and complicated face with plenty of class 5 cliffs and loose boulders to circumnavigate. “Spicy” was the preferred term for our newly companions of Capitol’s complicated terrain. It seemed a modest term for what we were looking at now. Most likely due to nerves, I was unable to sit for long and I stepped carefully out onto the ridge. Focused but un-anxious, I gingerly moved along the increasing exposure, passed a grippy false Knife Edge to a small point where the actual Knife Edge appeared before me. Here I stopped and waited as the rest of the group caught up. Ella was the first to join me. “We’re at the Knife Edge,” I said in what I hoped was a calm voice. “We are?” she asked timidly. I could tell she was nervous, but like me she was not unnerved to the point of debilitation. That was more than I could say for several people we had already encountered that day. 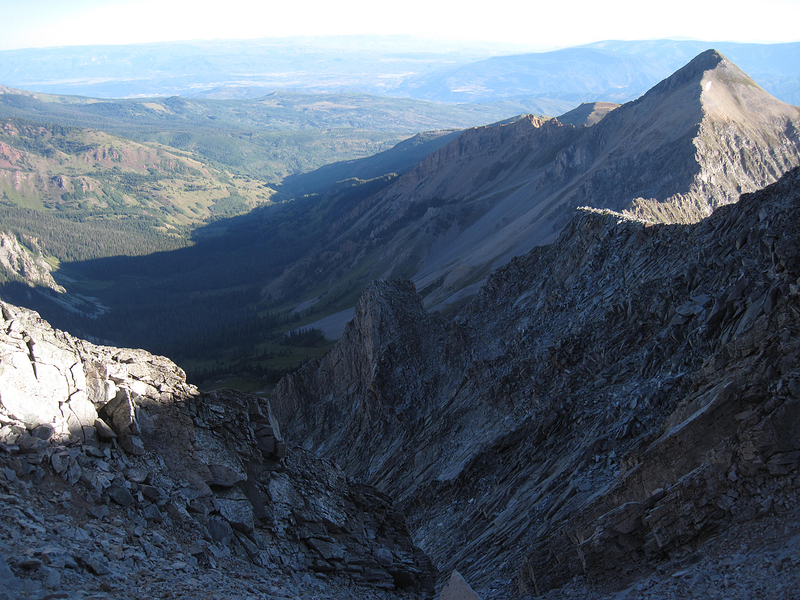 I pointed ahead along the ridge where you could see the Knife Edge just below us. It looked pretty spicy indeed. The other two joined us. The first one, Rob, looked confident and excited like us. J.C., the second, was obviously shaken by the airy position and unnerved by the obvious obstacle ahead. Ella and I decided to start across the Knife while Rob attempted to coax J.C. into continuing. I started across the Knife feeling strangely calm. My initial strategy was per the advice of Gerry Roach to “grab the edge with your hands and walk your feet underneath you on the south side of the ridge”. This worked well, but briefly, I admit, there was some of the “awkward” scooting on my part. As I had predicted, our group was reduced to three at the Knife. J.C. spent the rest of the day, not retreating to safer ground, as I would have done, but actually on the northeast ridge napping in the same spot we’d left him, awaiting our return! We continued along the ridge slowly, negotiating some tricky class 3 and 4 on some of the most exposed terrain on a 14er standard route. It was exhilarating and exciting. I always focused on the move just ahead of me without thinking too much about what still lie ahead. I tried not to look at the summit at all. When we moved out onto the east face and off the ridge at last, we face a long section of loose and complicated class 3 and 4 terrain. 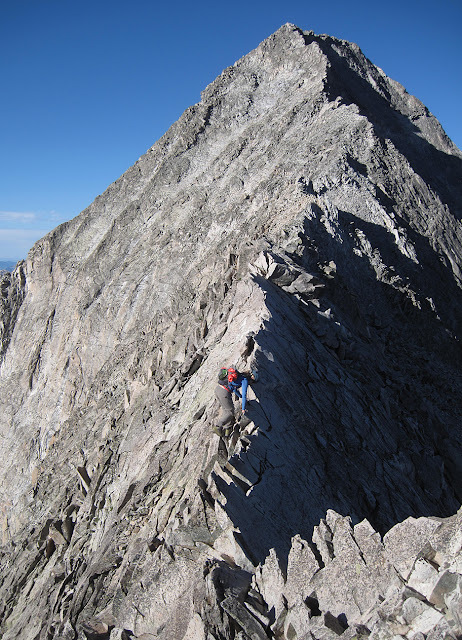 We zig-zagged up a shallow gully of lighter rock to a small notch on the southeast ridge 300 feet below the summit. We traversed carefully through here, occasionally just one person at a time up a pitch to avoid rockfall. Ropes would be useless in this broken rock. At last followed a set of cairns out on to Capitol’s south face, where we encountered some of the most difficult and sketchy rock of the climb. It was full-on class 4 with you-blow-it’s-over consequences. Still, however, I was able to keep my fear at bay. Shortly after, almost abruptly we found ourselves standing on the summit, the first to arrive on the day. It was 10:00 am now, the long and complicated climb had taken us just over 4 hours. We made a few calls on the summit and took down a snack and some water. Not necessarily because I felt particularly hungry but because I knew I should. We didn’t stay long on the summit, as the descent loomed. Getting to the top is only half the battle, and we knew that stats proved more mountaineering accidents happened on descent. Slowly we began downclimbing our way back towards the ridge below us where I could see the specks of a few people milling around the Knife Edge. We descended slowly, cautiously, trying to minimize the rocks and pebbles we kicked down the slopes below us. It was almost impossible to eliminate the trundling altogether. After what seemed like a very long time we reached the ridge and traversed back towards K2. Things seemed to move very quick now and we reached the Knife in no time. Knowing what to expect now, we breezed across it, even walking in places. Perhaps endorphins had kicked in, or maybe just adrenaline, but with the Knife behind us we almost felt comfortable enough to acknowledge our tick of one of Colorado’s most infamous mountains. We relaxed with our new friends on the summit of K2 (climbed it after all) for a good half hour marveling at Capitol above us. Several groups came to us, many of which we turned back by the Knife. It was interesting to watch it all transpire below us. We downclimbed one last section of class 4 before being faced with the long scree hikeout. After what seemed like an eternity of knee-jarring downclimbing camp was in sight. She agreed. 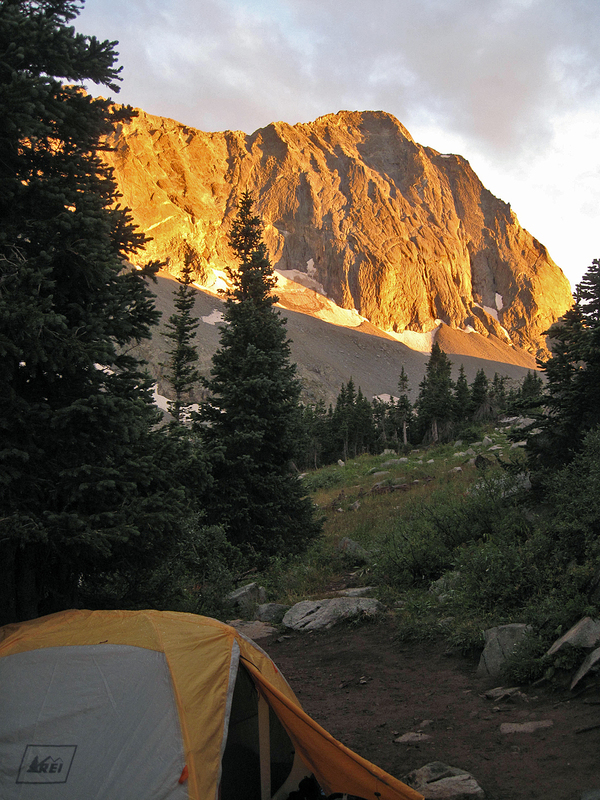 We threw our boots off and took a brief nap in the tent knowing that since we no longer had means of getting water, our second half night was out of the question and a six and a half mile hikeout was still before us.